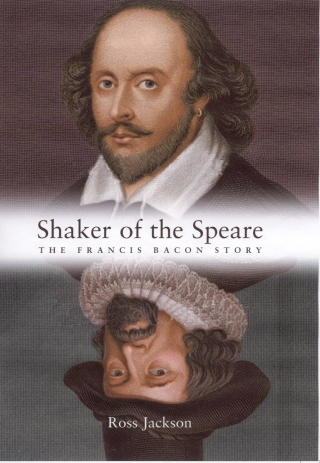 In a major work of fact-based fiction, Ross Jackson reveals the dramatic and secret life story of Francis Bacon — the multi-talented genius and Elizabethan philosopher, including his authorship of the Shakespeare works. Arguments and evidence for the authenticity of the novel’s storyline are convincingly presented in a second volume, The Companion to Shaker of the Speare. Much of the evidence, which was suppressed for national security reasons, first came to light as late as the 20th century, as the musty contents of old state archives in England, France and Spain entered the public domain for the first time. Bacon had to use a pseudonym because he was the love child of Queen Elizabeth and Robert Dudley, who were secretly married, as was well known by Elizabeth’s inner circle and the courts of France and Spain. As potential heir to the throne, his very life and Elizabeth’s crown were in mortal danger if the truth were to become widely known. The small-time money-lender and bit actor Will Shakespeare had a name that fitted perfectly the requirements of Francis Bacon, whose muse was Pallas Athena, the spear-shaking Greek goddess, patron of the Arts and Sciences. From the breathless love affair and secret marriage of the young Princess Elizabeth, to Bacon’s heartbreaking loss of his first love, Marguerite, to his pleading for recognition, to the political intrigues of Tudor England, to the tragic execution for treason of his younger brother, Lord Essex, by their mother, the Queen, to his orchestration of the renaissance in English literature, to his fall from power as Lord Chancellor, dramatic events swiftly unfold. Indeed, Ross Jackson shows us that the greatest work of literature in the English language is nothing less than the amazing life story of this giant of a man, thus enabling a far richer and more meaningful understanding of the Shakespeare works than has been possible to date. After reading this myth-shattering novel and The Companion, it is impossible that we will ever think of Shakespeare — or Bacon — in the same light again.